A study by learner driver and car sharing insurance specialist Veygo by Admiral and FirstCar magazine has revealed that in the first year after passing the test, one in eight (12%) drivers across the UK avoid getting behind the wheel; they don’t want to drive. It seems an odd conclusion to the investment of time and money they have put in, especially when three quarters believe their driving skills will deteriorate if they don’t drive. In the UK, learning to drive and gaining the hallowed licence remains popular, with two thirds (62%) of learners passing their test by the time they are 19. So why, once the ‘L’ plates are off and celebrations have died down, do so many put off driving? It probably comes as no surprise that finances are a key concern for most, especially when so many are off to study at university with the financial and time costs involved in that. It’s a key reason why half of new drivers have no access to a car, whether buying their own or be able to use someone else’s. Furthermore, over a third (38%) of people putting off driving because they felt running a car was simply too expensive. While this makes sense, it is perhaps worrying that after all those professional lessons, 7% of drivers said they were too nervous to go solo post-test, with 4% saying their parents were too nervous to let them drive. The results contradict their belief in the age-old saying ‘practice makes perfect’ - three quarters of drivers believed their confidence would increase in line with the post-test miles, and were concerned about deteriorating skills through a lack of driving. Interestingly, over half of new drivers were considering having more lessons to bolster their skills and self-belief, especially when only being able to afford old, less driver friendly vehicles (30%). While more young people are passing their driving test, less are getting their own car and the valuable experience they need. But not having their own set of wheels needn’t be a barrier. Veygo by Admiral offers flexible and affordable car sharing insurance so that anyone can borrow a friend or family member’s car, tailored to the drivers needs while protecting the owner’s insurance and No Claims Bonus. How important is a service history? We’re always told never to buy a car without a service history, but just how much difference does it really make? Should you automatically discount the purchase of a used car just because its service history is missing or incomplete? And what difference does it make if the car has been serviced by an independent specialist rather than a franchised dealer? Paterson adds: “Buyers will always gravitate towards a car with history as it provides peace of mind, but the age and brand of car can make a significant difference. Prestige cars would prove very difficult to move on without history but as they get older, condition becomes the main consideration. Budget cars are bought on price and condition, so the service history acts more as a selling feature than adding any additional value”. Scott Willis is sales director of Arnold Clark. He observes: “A lack of history simply means that the general condition of the car needs to be examined that bit more carefully and can make a small difference to the price paid. A service history is only one consideration, along with the vehicle’s cosmetic and mechanical condition, so the service history alone is significant but not crucial”. No surprises there then; a car with a service history is often more saleable and more valuable than one without. Paterson continues: “What can really make a big difference to a car’s value is a missing history. A three-year old car could be worth up to around ten per cent less without the necessary paperwork, but after 8-10 years or more, condition becomes the main consideration”. But just because you lose your car’s service history, it doesn’t mean it’s gone forever. Most manufacturers can replace a service book as long as the car has been maintained by a franchised dealer – everything is logged on computer. Complications are rare; you’ll need to prove that you own the car, the book may be marked as a duplicate and it may be that the service records don’t go back to when the car was new, but piecing everything together is usually possible – as long as it’s been maintained by an official outlet. Most buyers won’t touch a car if it’s done a huge mileage, which is why some unscrupulous sellers turn back the clock when they want to shift a high-mileage vehicle. By reducing the apparent mileage of a car, that vehicle will be more attractive to a buyer – as well as more valuable. Some modern cars have digital odometers, which can easily be reset with the use of the correct software. However, traditional analogue odometers have to be removed for the mileage to be wound back, so if the car has one of these, look for evidence that the dashboard has been tampered with. Damaged screw heads is one way of looking, or scratches in the paint around the screws. Whatever type of odometer is fitted, check that the wear and tear on the car fits in with the stated mileage. If the pedal rubbers and steering wheel are worn smooth, the car isn’t a low-mileage one. Ask for the car’s service history and previous MoTs; they’ll all have the mileage on, so make sure it goes up steadily and doesn’t suddenly drop. It has also been known for a car’s mileage to be reduced for the selling process, but once you’ve snapped it up, the odometer then mysteriously reverts to its true reading. That’s why you need tocheck the reading doesn’t suddenly shoot up between buying the car and collecting it. Petrol or diesel - which is best? With fuel prices higher than ever, new car buyers are often tempted to choose diesel automatically, as these are more economical. However, you pay a premium for a diesel car because they’re more expensive to produce – and you may have to cover tens of thousands of miles before you get that premium back. Most city cars and superminis are very economical even in petrol form – 55mpg is quite normal for some of the smaller 1-litre city cars. Buying a small car with a diesel engine may cost hundreds of pounds more, but it won’t necessarily be that much more economical. When you consider that diesel is usually more expensive to buy than petrol, it takes even longer to get your money back. Also, diesel cars are more complex, so more likely to go wrong; modern ones need a regular blast to clean their exhaust filters out, with lots of low-speed driving potentially causing major problems. Buying a small car with a diesel engine may cost hundreds of pounds more, but it won’t necessarily be that much more economical. However, there is something else to consider. When you come to sell your car, if it has a diesel engine it will probably be more saleable, so worth a bit more. Ultimately, you need to work out what the price difference is between the petrol and diesel variants of the car you’re considering buying. You then need to look at the difference in fuel economy, how many miles a year you typically drive and how long you’ll keep the car. Once you’ve established all those things you can decide which fuel makes the most sense - and the chances are that it won't be diesel. Your fuel choice should really be between petrol and diesel. Liquid Petroleum Gas is not as widely available as it was, and there are lots of dodgy conversions about. You might also want to think about a hybrid car, but bear in mind that the fuel consumption figures quoted for these are rarely attained in the real world because of the way the testing is done. In reality, if the car is driven flat out on the motorway, a hybrid car is no more efficient than a conventional one. You’ll only reap the benefits of a hybrid if you’re using the car in urban or more areas regularly, where you’re braking and accelerating more frequently. There's a bewildering array of cars out there; you've got all sorts of engines, gearboxes, makes, models and ages of car to choose from. Working out which will work best for you can be a daunting task, but if you tackle it methodically you should be able to narrow things down fairly quickly. With a limited budget and high insurance costs, you'll be very restricted with what cars you can afford to buy and run. The chances are you'll have to buy a city car or supermini, so you'll end up with a small hatchback of some kind. The important thing is to go into the buying process with a level head; you can't let your heart drown out your head, as you’ll probably only regret it. Start by creating a shortlist of suitable contenders; cars which are highly rated by their owners and the press, because they're reliable, cheap to run, practical and fun to drive. You can get a head start on this by reading our used car reviews section, along with our new car reviews if the car is still in production. 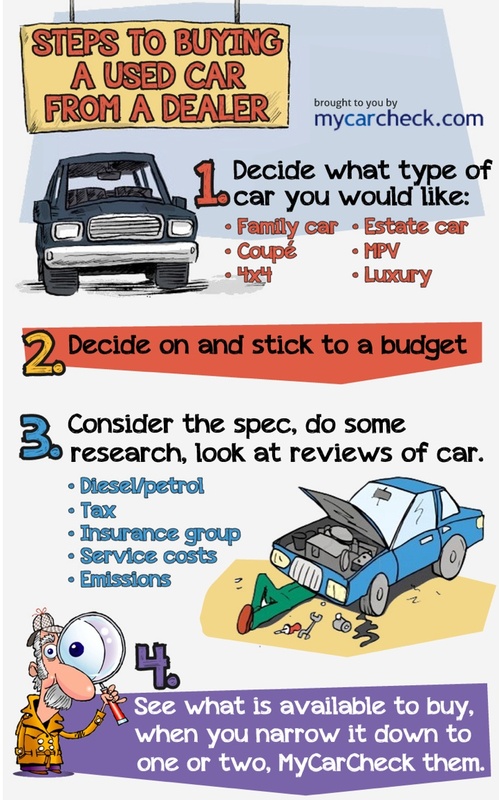 And don't forget to check out our page on researching a new car purchase - much of the advice also applies to buying a used car. Once you've got a shortlist together, start looking at what's available. It may be that the perfect Ford Fiesta is available this week, but in two weeks' time the ideal Volkswagen Polo will be on the market. So what you end up buying will be dictated by what's on the market at the time. The older the car, and higher the mileage, the more maintenance it’ll need. Parts wear out, so don’t expect the car to just keep working without regular servicing. Which makes more sense; petrol or diesel? For guidance on this, check out our separate page on the subject. Establish what the insurance costs will be. The only way to do this is to get a quote on the car you're thinking of buying; it's no good trying to guess, based on the car's value and your postcode. Also research the likely servicing costs; most cars have a fixed servicing schedule, and fixed-price servicing has become the norm, which should enable you to work out what you're likely to pay in maintenance costs. Do you want an automatic or manual gearbox? Self-shifting gears can be a real bonus with today’s traffic levels, but cars with an automatic gearbox use more fuel, and the majority of used small cars come with a manual gearbox. Don’t be put off by an ex-company car, even if it has a high mileage. Not only should it have been cared for mechanically (you can check the bodywork and interior easily enough) but most of the miles it will have been running hot. There’s nothing worse than a low-mileage car which has been run almost exclusively cold – it’s a surefire way of wrecking an engine. We all hear about a car’s EuroNCAP rating, but what does the term actually mean? In simple terms, a EuroNCAP rating gives an indication of how safe a car is, the name coming from the European New Car Assessment Programme. This independent body takes new cars and slams them into various walls and blocks, to see how they withstand impacts. But it’s not just about a car’s strength; EuroNCAP also looks at what kit is fitted as standard, such as ESP (Electronic Stability Programme), seatbelt reminders and speed limiters. Until 2009, all cars were awarded a star rating according to how well they looked after adult or child occupants, as well as how little damage they did to pedestrians.But the system has now changed so that just one rating is given to the car - which means that to get a five-star award, the car has to be fitted with lots of safety features, be very strong so it looks after its occupants both large and small and it also can't mangle pedestrians too much. It’s this last one that’s the trickiest, as when a car hits a pedestrian, the car is pretty much guaranteed to win every time. Before you can make a decision on buying a car you need to ensure that the paperwork is in order. If the owner doesn't have all of these pieces of paper to hand, make it clear that you're not going to buy the car. Sourcing replacement documents isn't always easy and in some cases it isn't free either. Registration document or V5C. This tells you the basics about the car’s history such as how many owners it has had and who it is currently registered to. Bear in mind that the person named on this form is not necessarily the legal owner of the car. Don’t buy a car without one of these and make sure it’s a genuine document by holding it up to the light and looking for the watermark. The MoT. With the system now fully computerised, everything is logged centrally and can be looked up instantly - you can check the MoT status of any car by looking it up on the official government website. If a car isn’t MoTed it can’t be taxed – and neither will it be insured. Ask to see the car’s service history. Ideally, the car will have been maintained by the supplying dealer from new, but what you’re after is proof of regular servicing. You can also ensure the mileage goes up in the right stages. You can easily put a car through an MoT whenever you like, and when you buy a car you must tax it in your name from the outset, as road tax is not transferable when a car is sold. The V5C is the most important document of the lot; the name on this piece of paper is the person to whom any speeding tickets or other motoring fines will be sent to. If that person doesn’t deserve them, they have to prove why this is the case – and not telling the DVLA of a change in vehicle ownership is an offence. There are around two million new car sales each year in the UK – but about four times as many used cars change hands. Many of those vehicles have some ‘history’, so you need to ensure that you don’t buy one that’s worn out or been pranged – or one which has outstanding finance on it. If you read these pages you can minimise the risk of buying a duffer, but as some of the information that relates to buying a used car also relates to buying new, make sure you also check out our new car buying advice pages. If you buy a used car privately, you’re not in as strong a position as if you buy the car from a trader – but there are still ways that you can redress the balance. The key thing to remember is that if something appears too good to be true, it almost certainly is. Because there are two peaks in the new car market (1 March and 1 September), there are lots more used cars around at these times. Consequently, dealers are keen to sell these trade-ins as quickly as possible, so think about buying your used car at one of these times when supply is usually greater than demand. When you buy a car you’re reliant on its identity being what it appears. However, things are not always what they seem, because it’s possible for a car to be stolen, then given the identity of a written-off car – a practice known as ringing. While this should still set alarm bells ringing, at least the car is legal, if not necessarily desirable, when it’s merely recorded as previously a write-off. You can guard against buying a ringer by inspecting the registration document closely and ensuring that the numbers on it match those in the car you’re viewing. You then need to make sure that the car you’re looking at is the one that’s legally entitled to that identity. Look for evidence of chassis plates having been swapped; loose rivets is a classic giveaway. Also look for evidence of a recent respray, and make sure you’re looking at the car on the seller’s drive. Those involved in ringing tend to be part of organised gangs that vanish without trace once you’ve paid for the car and taken it away. If you do end up buying a ringer, don’t try to sell it on as you’ll be liable to prosecution. Tell the police and in the case of a purchase from a dealer, also tell Trading Standards. It’s essential that you don’t get taken in by this scam, because if you do you’ll lose the car (which belongs to the insurance company) as well as your money. If you’re not careful, you could end up getting two cars for the price of one when you next buy a used car. Unfortunately, to be more accurate, you’re getting two halves for the price of one whole, because you could end up buying a cut and shut. Such vehicles are the result of two written-off cars being used to create one apparently good vehicle. It works by welding the front half of a rear-ended car to the back half of a car that’s been in a serious front-end smash. The cars are cut up then welded together to create a car that looks straight. However, while the car may look fine, it’s a rolling death trap that’ll disintegrate in the slightest impact. To make sure you don’t get taken in by this scam, you need to look closely along the top of the windscreen as well as underneath the seats. It won’t take much to see the join from underneath, unless copious quantities of underseal have been plastered everywhere. Also look out for badly mismatched paint as well as overspray on the glass and trim; these suggest the car has been repainted at some point. Mismatched trim inside the car is another giveaway. You should never buy any car – new or used – without taking it for a test drive first. Fail to do this, and a whole stack of mechanical faults could be just waiting to tear the heart out of your wallet. You also need to make sure you can get comfy; it may sound mad, but if you don't give the car a decent run before you buy it, you could end up with transport that gives you aches and pains after just a brief drive. Before you think about this though, start the car from cold, and make sure it ticks over happily. Let the engine warm up and ensure the cooling fan cuts in before taking it for a decent run that will allow you to try out all the gears as well as the major controls, brakes, steering and suspension. Have the steering wheel and gearknob been worn smooth? Does this tally with the recorded mileage? Is the interior undamaged, along with all the glass? Are there any stickers on the windows which may have been put on to cover an old registration number etched onto the glass? Check for rust that’s been painted over, plus filler in the wheelarches. Once rust arrives, it’s very hard to eradicate. Ensure all the electrics work – try everything. It’s the same with the instrumentation – does it all read as it should? Is the exhaust chucking out soot? If so, the engine may have had it, although some diesels can be pretty sooty even when reasonably healthy. Does the car drive well, with no pulling to one side under braking? If the car hasn’t been used for a while it may need a few miles to settle down – but not a car that’s been in regular use. Diesel engines are more efficient than their petrol counterparts, and the modern turbodiesel engine provides muscle with economy and refinement – so it's no wonder there's been a move away from petrol and towards diesel-powered cars in recent years. The key downside is that diesel cars cost more to make (and hence more to buy) than their petrol equivalents, which is why they don't make sense for many low-mileage drivers. There's another reason though, why low-mileage drivers are best buying petrol instead of diesel, and that's the diesel particulate filter (DPF). A DPF needs to get up to temperature to work properly, which means regular high-speed runsOne of the characteristics of diesel engines is that they emit soot particles, which hang in the air and lead to breathing difficulties – and cancer. Suddenly the diesel engine isn't looking so attractive, is it? However, a diesel car's exhaust emissions can be cleaned up, to get rid of these particles, which is where the diesel particulate filter comes in. The DPF traps the soot then burns it off at very high temperatures, to help improve air quality. The problem for low-mileage drivers is that a DPF needs to get up to temperature to work properly, which means regular high-speed runs. Without these the filter gets clogged up with soot particles and it can lead to major issues and costs; replacing a failed DPF can easily cost over £1000. So if you're looking at buying a newish diesel car, and you don't drive many miles, check whether or not it has a DPF. Because if it does, you will probably be much better off buying a petrol-engined car instead. While this is good for your pocket, it’s not much good for the environment, which is why from February 2014 your car would fail the MoT on its exhaust emissions, if it came out of the factory with a DPF, which has since been removed. So if you’re buying a second-hand diesel-powered car that was made after September 2009, make sure it’ll pass an MoT. This isn’t the date from which DPFs became mandatory, as they’re not actually a legal necessity as such. But car makers have had to fit a DPF to pass the strict emissions laws introduced in September 2009. If you visit a car auction as a spectator – which is a ‘must’ before you even think about buying a car at one – you’ll be amazed. Possibly even terrified. Half the time you can’t tell who’s bidding, particularly if the buyers are traders rather than members of the public. And then the bidding goes so quickly, and the auctioneer speaks in such a gabble, that it’s hard to tell what level the bidding has reached. You can pick up a real bargain at auction but you can also be bitten – hard. It’s potentially the cheapest way to get the car you want but it’s also very easy to come unstuck. All the usual warnings about buying a used car apply when buying at auction; only more so. There is little or no opportunity to see the car running. Many cars are ‘sold as seen’, so there’s very little comeback if you buy a dud. The number one piece of advice is to take someone with you who knows about cars and who is used to buying at auctions. Every auction has its own terms and conditions: read them very carefully before bidding. First, clarify the buyer’s premium – the commission you pay to the auction house over and above the hammer price. And check how each car is described. If it’s ‘sold as seen’, and the engine blows up the first time you drive it – tough. Even if it’s described as being in good working order, test it as soon as you’ve paid, as you have only a short time in which to complain – often just an hour! Even more importantly, don’t take your new purchase onto the road unless you’ve had someone with mechanical knowledge check that it’s safe to drive. It’s not all bad news, though. It is, for example, a bit of a myth that scratching your nose at the wrong moment can mean you accidentally buy a car. Experienced auctioneers are a strange breed with superhuman powers, who uncannily know who is bidding for what. Visit a few auctions before buying to get the feel of what goes on. Learn about such things as reserves (the lowest price the seller will accept) and commission bids (written bids submitted beforehand). Read the terms and conditions of sale very carefully: they’re different for every auction house. For example, the price you pay will be considerably more than your final bid. The auctions charge a buyer’s fee – typically a percentage of the ‘hammer price’. Test the car as soon as you’ve bought it. You’ll normally have only a very short time in which to complain if it’s not as described. The most often-repeated and most ignored advice: set yourself a price limit and don’t go beyond it! Don’t forget in the heat of the moment how you will get your new car home: insurance is your responsibility from the moment the hammer falls. Generally, you’ll be expected to take the car away within 24 hours, or you risk being charged for removal and storage. Some auctions, such as BCA, offer a delivery service. You’ll usually need to register as a buyer before you can bid, which means taking along some form of ID such as passport or driving licence. Sometimes you put in a bid, the hammer falls, and you assume the car is yours. Then you discover that your bid didn’t reach the reserve – the lowest price the seller is willing to accept. This gives you the chance to think about upping your bid to the reserve, or walking away. Garages that sell new cars tend to have monthly targets to hit. If they hit these targets they'll get a bonus - and if they don't, they won't. So it's in their interests to make sure they hit those targets. That's easier said than done though, if the target is high and there are no customers to sell to. The thing is, the new car market doesn't work on sales – it works on registrations, which is something else altogether. Car makers focus on new car registrations because that's seen as the marker of success. So if a garage can't find a customer for that car sitting in the compound, it can register the car in its own name. So while the car hasn't been sold as such, it does go down as a new car registration, because it’s been registered. But the dealer has a problem; it has a car registered in its own name, but it doesn't have a buyer for it. What's more of an issue is the fact that because the dealer's name is now on the registration document, when the real first owner coughs up and gets the car registered in their name, they'll appear as the second owner, so it’s effectively a second-hand car. To entice customers into buying these 'pre-registered' cars, the dealer has to sell them at a reduced price, even if they've covered virtually no miles. After all, the car is – on paper at least – a used car. If you're wondering what the point of it all is, it's because the success of a car maker is often judged on how much of the new car market it has. It used to be the case that all mainstream car makers effectively bought their market share by registering huge numbers of new cars. But times are tough now and such tactics lead to big losses. And most car makers are struggling to survive, so they can’t afford to buy market share so much, which is why although pre-registering still happens, it's not as common as it used to be. So why should you care about pre-registered cars? Simple – you can potentially buy a brand new car for the same money as somebody else’s used car. If you want to take advantage of a pre-registered bargain, watch out for supposedly used cars being advertised with delivery mileage only. As the targets have to be hit at the end of the month, it's at the very end of the month or the start of the following that these pre-registered bargains are to be had – but finding them is completely hit and miss. A dealer might have several one month then none for ages after that – which is why you need to shop around. It's the same for all of us. Whenever we buy a used car there's always that nagging doubt at the back of our mind. Just how can we be completely sure that we're not being taken for a ride? And how can we be sure that the car we're buying won't break down after just a few miles? The simple answer is that there are no absolute guarantees that any used car purchase will be completely trouble-free - but it's the same with brand new cars too, as any car can give problems. If you buy a used car from a dealer you’ll have a warranty, even if it’s just for a few months. However, any dealer has overheads so you’ll always pay more if you take this route - but if you do have problems they'll hopefully still be trading so you can pin them down in a bid to get their help. Depending on the car’s age and mileage, the warranty may not be a very good one so read the small print and make sure that you know what’s covered. When it comes to buying privately, you need to have your wits about you. There are plenty of dealers masquerading as private sellers and working from home. When you phone up, ask about ‘the car for sale’ without specifying which one. If they need clarification, they’ve clearly got several vehicles up for grabs. Don’t buy a car from someone who will only give you a mobile number, because they’ll probably be untraceable if something major goes wrong. If a specific time is given for calls to be made, it’s probably because the seller is using a public phone box. Phone outside the specified time and see who answers. Don’t look at a car in the rain or at night – the paintwork always looks great in these conditions. Insist on visiting the seller’s house to inspect the car; ensure this is at the address on the registration document. Weigh up how well kept the owner is along with their house and garden. If they take no care of themselves or where they live, it’s unlikely they’ll have cherished their car. An increasingly common scam is the theft of a vehicle’s identity; it’s called cloning, it works very simply and it’s very easy to get caught out by it. Cloning works by thieves stealing a car and giving it the identity of a legitimate vehicle. Although the car you’re looking at is stolen, you don’t know its real identity because you’re checking the identity of a different vehicle. Ensure the car’s chassis number matches the one on the registration document. Always pay by bankers draft rather than cash; a legitimate seller will be happy with this, but car thieves won’t be. Inspect the car at a privately owned residential address – and make sure the seller isn’t just using the drive of a house whose owners are away. Also ensure that this is the address shown on the registration document. The chances are you're not a trained mechanic - so just how do you go about quickly establishing whether the car you're thinking of buying is a complete heap? It's easier than you might think; just a few quick checks can soon tell you whether or not that potential purchase is a complete liability. While it's true that there's a whole stack of issues that can crop up with a car, a few basic checks can reduce the chances of you getting stuck with a lemon. Here's what you need to do to see if it's basically worth buying - and if you're not comfortable making even these rudimentary checks, don't forget that you can always call in the experts and get a professional inspection. Check the MoT certificate if the car is over three years old. Check the registration document; if this isn’t to hand, just walk away. The same goes if any of the details are incorrect. If you can, phone the previous owner and ask them about their old car – its mileage and history. Also ask them why they sold it. Make sure that the chassis and registration numbers on the car match those on the registration document and MoT. Ask for proof that the car has been serviced. There should be a service book, which will have been stamped by the garage which has maintained it. Make sure you’re insured before taking a test drive. Look closely for dents and scrapes in the bodywork; also check panel fit. Any damage will be costly to put right, so haggle accordingly or walk away. Are the tyres okay, with no uneven wear? If they’re worn out altogether you’ll need to budget for new tyres. If they’ve worn unevenly it could be poorly aligned tracking or something more serious – such as a twisted bodyshell because of poor accident repairs. Do all the speedo digits line up properly? Are the old MoTs to hand and does the mileage recorded on these forms tie in with what’s displayed? If you suspect the car has been clocked, contact your local Trading Standards office and tell them about it. Get an HPI check done, which will tell you whether the car is subject to any outstanding finance. It will also tell you if the registration is the original one and whether or not the car has ever been involved in a major accident. Does the chassis number (usually at the base of the windscreen on the passenger side) tie up with the one on the registration document? Also check the engine number, which is usually on the top of the block, down the one side. Are all the keys available with the car? There should be at least a spare and probably a master as well. Lose the only key and you may have to have everything reprogrammed – which can cost hundreds of pounds. There are lots of places to buy a used car; from private sellers to traders of different kinds - or if you're feeling adventurous (and probably not just a little bit reckless) you could even go to an auction. Buying privately: this route is generally the cheapest way of buying a used car, but beware of over-optimistic pricing and there’s no warranty. The key is to make thorough checks on any potential purchase and if the car will need any cash spending on it in the short term, haggle the cost of doing this work off the seller's asking price. Franchised dealers: these usually have newer cars in stock, which will often be better cared for and have lower mileages. The downside is they also charge the most in general, and while they'll be your best mate up to the point of purchase, once they've got your cash there's no guarantee that you'll be quite so loved. However, the weight of consumer law is on your side if they sell you reall lemon then fail to do anything about it. Independent dealers: these usually offer the same facilities as a franchised dealer, but the cars tend to be higher mileage. Again, you've got lots of consumer protection, but as with the franchised dealers there's no guarantee that you'll be looked after. For the optimum balance of value and peace of mind, the independent car trader tends to be the best best. Car supermarkets: these offer low prices as they sell lots of cars and make a small profit on each. They tend to focus on mainstream cars only, but there’s usually plenty of choice. However, if problems crop up post-sale, you might struggle to get effective fixes quickly as supermarkets don't specialise, so they don't have the marque-specific expertise that a franchised dealer would have. Auctions: the lowest prices are here, but it’s easy to buy a duffer if you’re not careful. Buy here with caution as there may be very little comeback in the event of problems. When it comes to talking turkey, ensure you pay less than the initial asking price. Private sellers are required by law to describe the car honestly and accurately. However, that’s the only requirement as the car only has to be ‘as described’ and you have no redress. Getting your money back from a private seller or sorting a problem will be difficult, so check the car thoroughly before buying. Use a banker's draft, as paying cash offers little comeback. Any genuine seller will be happy with this. Pay by credit or debit card, as it brings extra legal protection from the card company. A banker's draft is still a good way to pay here, too. Dealers have a duty to describe the car accurately and it must meet a standard expected of a car of its age, mileage, price and condition. If it doesn't, you have protection under the Sale of Goods Act for the dealer to sort the problem, provide an alternative vehicle or even refund your money.